Page 4: Kobayashi Naru - Kwah? Here's a most unusual game in which you explore a landscape of more than 40 screens in your spherical ship, trying to find three different objects. The reason why it's unusual is that there are all sorts of strange gravitational effects which make your ship very tricky to control; each screen has a different effect and you'll need to work out how to battle against the effect. When you have collected the three objects in the right order, normal gravity will be restored. 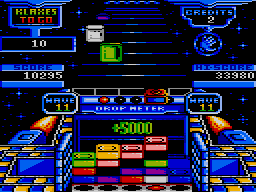 The graphics are rather Spectrum-like, although some clever tricks allow more than the usual number of colours on the screen at the same time. 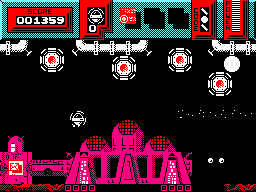 However, I found that controlling the ship was just too frustrating to make the game enjoyable. Here's a great puzzle game which is a cross between Tetris and Connect 4. Coloured tiles come down a conveyor belt into a hole where you must create rows or columns of the same colour, which are called Klaxes. On each level, you'll be given a certain number of Klaxes or diagonals to make in order to complete the level. This is a stunning and original game with excellent graphics and two nice (but short) tunes, although it's pretty difficult. By the way, the cartridge version is exactly the same as the normal one, and makes hardly any use of the Plus' extra facilities. 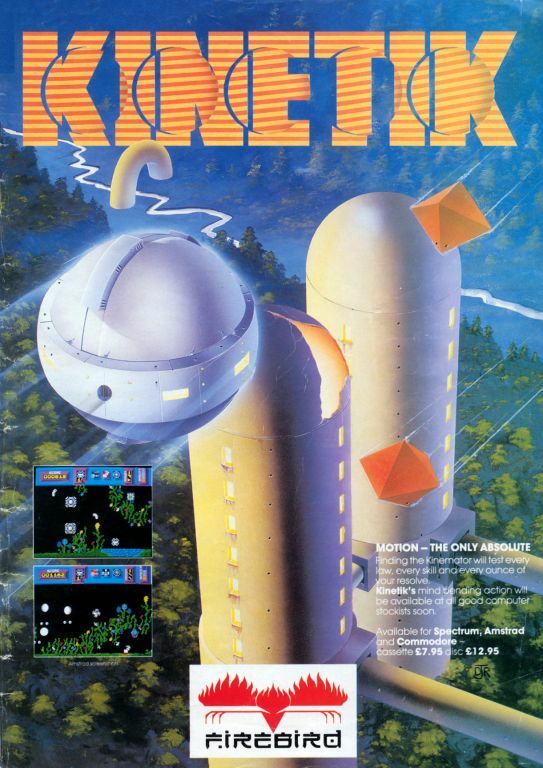 Watch YouTube videos of this game by: ChinnyVision, Novabug (cartridge version). If there was ever a game that demonstrated the phrase "gameplay is more important than graphics", this would be it. The sorceror Red Sabbath has cloned himself over four time zones, and as the knight Fair Storm, you have to destroy all of the clones. Each of these zones only has four screens, which isn't very much at all. Correspondingly, the game is made very difficult indeed – you have to kill the enemies in each zone in exactly the right way before they die, and there are other traps which can kill you instantly. It is worth looking at just for the loading screens and the graphics (which are some of the best ever seen on a CPC), but there's not much of an actual game in there. 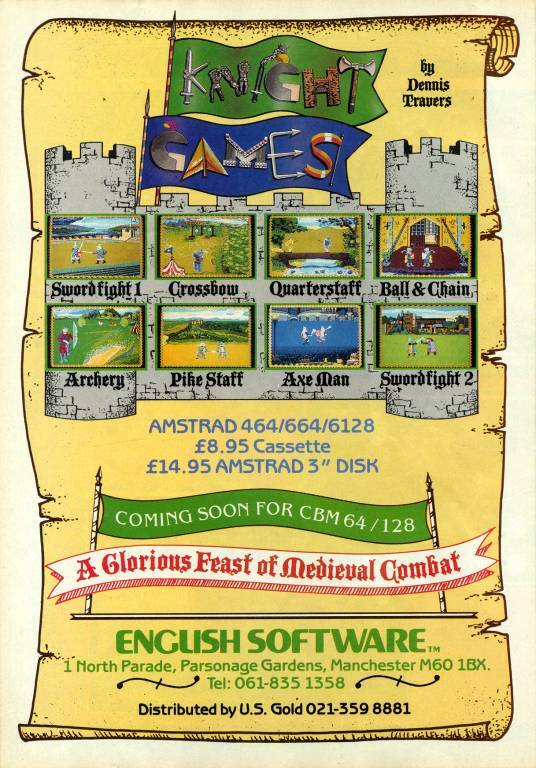 Billed as "a glorious feast of mediaeval combat", this game consists of eight combat events, in which you try to defeat your armoured opponent with various types of weapon, and two shooting events, in which you fire either arrows or crossbow bolts at moving targets. However, this is a disappointing game overall. While the graphics, animation and music are all of a high standard, and the shooting events are quite enjoyable, the combat events are not. Your opponent can be defeated easily by using one move repeatedly, and it takes ages, and literally hundreds of blows, to defeat him – even when you select the 'short' time limit. As a result, the game soon becomes boring and there's no incentive to want to play it again. In this strange little Spanish game, you take the role of a podgy little man with a permanent grin, and must explore a spooky old castle, gathering the tools needed to free your friend – a ghost – who has been trussed up in a cage (why doesn't he just float through the bars?) Of course, like virtually all Spanish games, the difficulty is cranked sky-high. The castle is a maze of epic proportions, with all the rooms very similar in appearance, and although enemies are fairly few and far between, and you can collect talismans to destroy them, you'll soon run out and have to resort to jumping over them – an action requiring supreme precision. And on top of all that, the graphics and sound are very bad as well. Infected by the jungle wolf from his adventures in Sabre Wulf, Sabreman makes his way to castle Knightlore in order to find the great wizard Melkhior to cure him of the curse of the werewolf. However, the mage does not grant an audience easily and has surrounded himself with numerous guardians for protection, and a labyrinth of traps and tests all around to prevent all but the most persistent of unwanted guests from reaching him. Your goal is to find the potion within the timespan of 40 days and nights or you will remain a werewolf forever. Superb puzzle game with your character's midnight-changing shenanigans being particularly amusing! Watch a YouTube video of this game by: Metr81. The TV series this game was based on was brilliant – a young adventurer has to go through three levels of a dungeon, solving puzzles and avoiding traps along the way, aided by three of his friends. 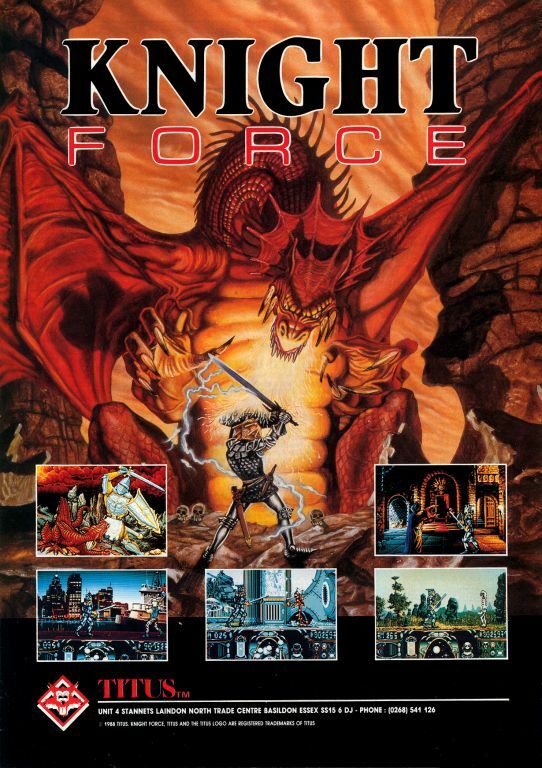 The aim of this game is slightly similar and retains some features of the TV series; you have to defeat the dragon lurking somewhere in the dungeons, and must enlist the help of the oracles and Treguard the dungeon master. The graphics are fairly basic but aren't bad, but there are very few sound effects and even these aren't good. It's not a bad game, actually, although the hardest part is getting out of the first two rooms! Michael Knight and his amazing talking car KITT have received news of a nationwide terrorist plot to bring about the destruction of America, so they must save the day. 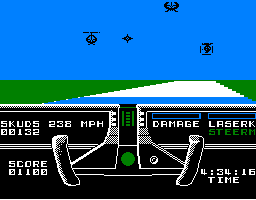 Based on the hit 1980s TV show, the game has several quests to choose from, such as foiling the assassination of the President or locating the terrorists' hidden bomb supply, and two different styles of gameplay; a basic driving game where you can control either the handling of the car or the shooting down of enemy helicopters (the computer controls the other), and an overhead-viewed stealth-type game for when you are inside buildings. Despite a nice feeling of being involved in the missions, the game is let down by its appalling graphics, basic sound, its long tedious driving sections, and the fact that it's far too easy. 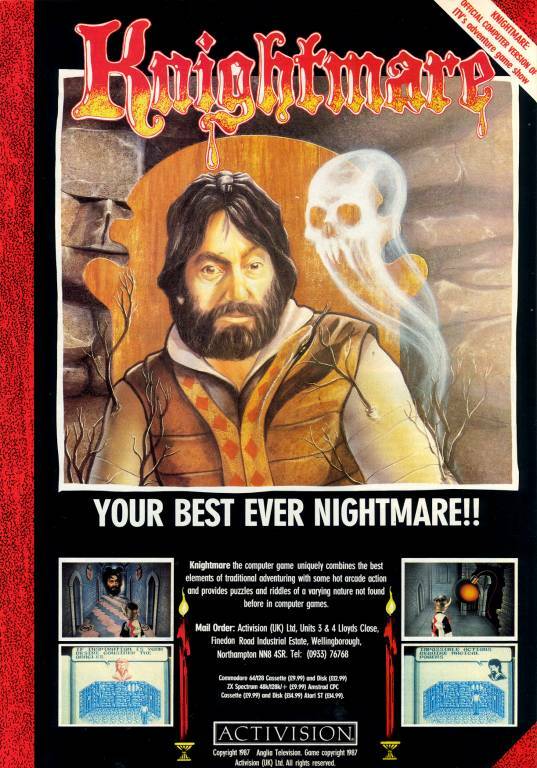 Knights and Demons is based on the well-known 1990s board game Lights Out. It is smartly written in BASIC. The game features a grid of tiles and the aim is to switch all the tiles on the board to the same type (either knights or demons). 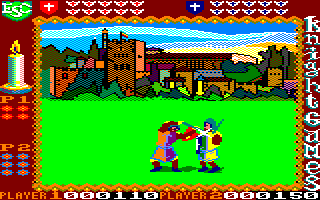 The graphics are drawn in MODE 0 but the colour selection may be sore on some players' eyes. They are also blocky and there is no background. Nevertheless, they do their job and the tiles are interestingly drawn. The intro screen is also good. There is an atmospheric tune which plays during the game. The gameplay is interesting and depends on whether you like this style of game or not. Personally speaking, I found it interesting and gave it a number of tries. Overall, and taking into consideration that it is a BASIC game, it is worthy of your interest. 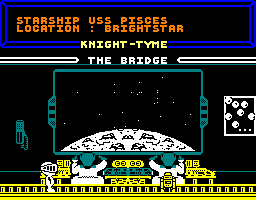 After rescuing Gimbal in Spellbound, Magic Knight is now a stowaway on board the USS Pisces starship in the 25th century, and has to find some way of getting home. The first thing he'll need to do is to authorise himself and to take the ship to the nearest starbase – then he can transport the ship all around the star system and visit lots of planets. This is the third of four games featuring Magic Knight and I think it is the best of the lot, although you'll get sick of the music before long. It's not all that difficult, but there are a lot of interesting characters to meet. This is my favourite game in the Magic Knight series. See also: Finders Keepers, Spellbound, Stormbringer.